Students investigate conditions in the deepest parts of the ocean, make inferences about ocean creatures based on their physical characteristics, and design creatures that could survive in the Mariana Trench. 1. Activate prior knowledge by introducing or reintroducing James Cameron’s historic Challenger Deep dive. Explain that Cameron’s submersible was under 8 tons of pressure per square inch while he was in the Challenger Deep at depths of up to 10,898 meters (35,756 feet). Ask: Could Cameron (or any person) survive under that much pressure at those depths without being protected inside of something? Could other living creatures survive at those depths and that pressure? How? What other living creatures do you think Cameron was likely to encounter at those depths? 2. Divide students into pairs and have them review the characteristics of the ocean zones and match ocean animals with the ocean zones in which the animals are found. Briefly review the characteristics of each ocean zone, using the provided NOAA Layers of the Ocean website if necessary to refresh students’ memories. Give each pair of students a photo of an ocean animal from one of the provided websites or point them to an animal on one of the websites. Have students look at the photos of the animals, read the captions, and list as many characteristics and adaptations of the animals as they can. Then have them compare the lists of characteristics and adaptations to the different ocean zones to predict in which zones the creatures live. 3. Have students investigate the hadalpelagic zone. Distribute the Deep-Sea Creature Project Planner worksheet to each pair of students. 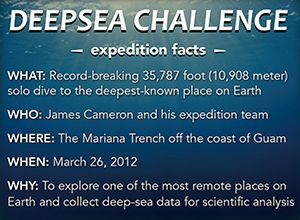 Have students read the information about the Mariana Trench from the provided DEEPSEA CHALLENGE, Windows to the Universe, and NOAA Layers of the Ocean websites. Have them list unique characteristics of the hadalpelagic zone in the first column of the worksheet. 4. Have students brainstorm adaptations related to the characteristics of the hadalpelagic zone. For each characteristic of the hadalpelagic zone that students listed on the Deep-Sea Creature Project Planner worksheet, have them brainstorm possible adaptations that would allow an animal to survive and thrive in a place with that characteristic. Ask them to also consider adaptations related to senses or physical characteristics that would not be needed there. For example, if they listed that the hadalpelagic zone is dark, they might include adaptations such as acute hearing or sonar to aid in navigation and/or the loss of eyesight because it would be of little use in that environment. Encourage students to list as many possible adaptations as they can. 5. Have students predict what Cameron saw on his dive by drawing never-before-discovered creatures that could survive in the Challenger Deep in the Mariana Trench. Distribute the Deep-Sea Creatures Rubric, paper, pencils, and colored pencils, pens, or markers to each pair of students. Review the Deep-Sea Creatures Rubric with students and make sure they understand how they will be assessed. Ask students to select adaptations for their animals from their brainstormed lists. Adaptations should cover all the unique characteristics of the hadalpelagic zone, although some adaptations might address more than one characteristic. Have students draw, color, and clearly label their creatures. 6. Have students share their creatures with each other. Arrange the class into groups of two to three pairs each. Have each pair present its creature to the other pair(s) in the group and describe how the creature is adapted for survival in the hadalpelagic zone. After group members have presented to each other, display all the creatures in the classroom and give students a chance to walk around and look at each other’s work. Use the Deep-Sea Creature Rubric to assess students’ creatures. Discuss how the creatures are similar to and different from one another. Ask: How does the diversity of the creatures you and your classmates designed compare to the diversity of real animals in the hadalpelagic zone? 7. Show the "Absolute Edge of Life" video and discuss what James Cameron actually saw during his historic dive into the Mariana Trench. Ask: How did your predictions compare to what Cameron saw? How was what Cameron saw different from what he expected to see? What lesson did he take away from that? Do you believe there are animals in the deep oceans that haven’t been discovered yet? Why or why not? Use the provided Deep-Sea Creatures Rubric to assess students’ creatures. Provide students with a variety of art supplies and throw-away materials such as soda bottles, colored paper, Styrofoam, and sequins. Have them create a three-dimensional model of the creature they designed. Have students research a creature that lives in the hadalpelagic zone. Have them sketch and label the creature and identify specific adaptations the creature has for surviving in the deep-sea environment. Principle 5c: Some major groups are found exclusively in the ocean. The diversity of major groups of organisms is much greater in the ocean than on land. The ocean is vast and teeming with life. Because of its size and depth, the ocean contains more than one habitat for aquatic life. Scientists divide the ocean into various zones. These include the epipelagic zone (sunlight zone), mesopelagic zone (twilight zone), bathypelagic zone (midnight zone), abyssopelagic zone (abyssal zone), and the hadalpelagic zone. The zones are differentiated based on depth, and each has unique characteristics and unique forms of life that are adapted to conditions in that zone. 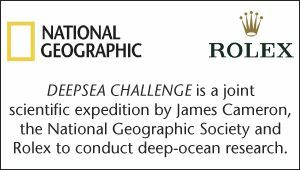 The deepest ocean zone, the hadalpelagic, was the focus of James Cameron’s historic DEEPSEA CHALLENGE expedition. The hadalpelagic zone is found from about 6,000 meters (19,700 feet) to 10,911 meters (35,797 feet) in ocean trenches such as the Mariana Trench where the DEEPSEA CHALLENGE expedition took place. The characteristics of the hadalpelagic zone include extreme cold, extreme pressure, and complete darkness. The temperatures in this zone remain just above freezing and the pressure reaches more than 8 tons per square inch. Though much of the deep ocean remains to be explored, scientists have identified organisms that can survive in these extreme conditions, including tubeworms, jellies, sea cucumbers, and foraminifera. These creatures have adapted to their environment in unique ways. For example, tubeworms survive near hydrothermal vents where volcanic activity can create areas of very high temperatures. Bacteria living inside the tubeworms have adapted to use the chemicals in the hot waters rising from the vents to produce energy in the absence of sunlight. Other adaptations of organisms in this zone include diminished use of eyes and sight, soft bodies, slow movement, limited pigmentation (red, black, or transparent), and bioluminescence. zone of the open ocean, starting at 3,962 meters (13,000 feet) below sea level. zone of the open ocean, starting at 914 meters (3,000 feet). Also known as the midnight or aphotic zone. upper zone of the ocean. This zone goes down to approximately 183 meters (600 feet). Also called the euphotic or sunlit zone. deepest zone of the open ocean, starting at around 6,000 meters (20,000 feet). zone of the open ocean, extending from about 183 to 914 meters (600 to 3,000 feet). Also known as the twilight or dysphotic zone. force pressed on an object by another object or condition, such as gravity.